We survived Grayson's party. Whew! No, actually it was really great and all this kids had a super time! We held it at the VRRI, a local recreation facility and the kids had an hour with an instructor in the gym with lots of equipment and games and fun. 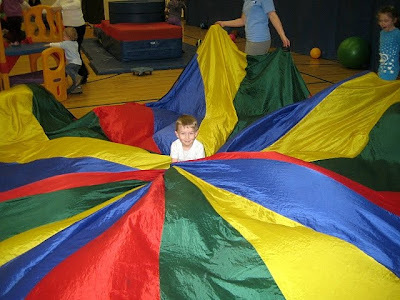 The trampoline was a big hit as were the parachute games! The kids ran off a whole bunch of energy and were pleasantly tired when they were fnished in the gym! Then we had a great private room for the rest of the party. I had crafts ready (yeah, you know me!) but with lunch, cake and a few presents, the time was up before we knew it. (As a matter of fact we didn't even get all the presents opened before moms and dads were arriving to pick up the party guests.) 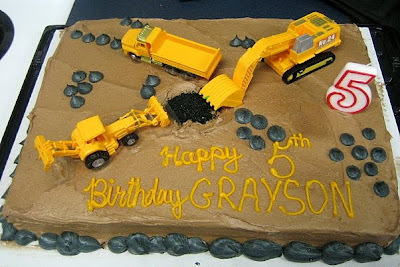 Grayson wanted a construction theme for his party so we found plates and decorations with diggers on them and there was a great cake with removable toy mighty machines. Everyone enjoyed themselves (especially the birthday boy!) and the best part for me was no mess to clean up! We headed home for an afternoon rest and then had Grandpa over for supper (and finished off the cake for dessert!) 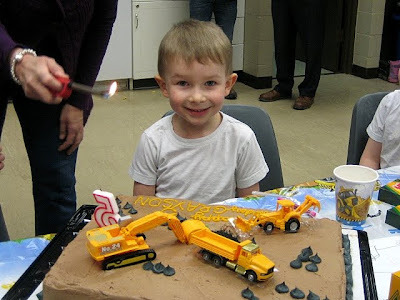 It turned out to be a really great party for my big five year old boy! Wow - I love that birthday cake! The party looks like it was a lot of fun!